It’s a Merry Monday indeed! 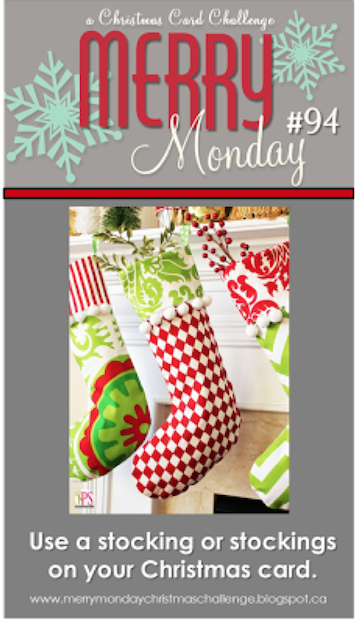 I am thrilled to be a Guest Designer this week over at Merry Monday! A huge THANKS to Lesley and Bonnie for this opportunity! Look at this Great Inpspiration photo that we had to work with this week! The requirement is to use a stocking and or stockings on your card. and the holly berries that are peeking out of one of them. The sentiment is from VERVE …the Holly Jolly Christmas set. and cut out with scissors. The berries are a hole punch. The EF is called Square Lattice from SU. Lots of distressing and some hemp and that about does it. Join the talent team and I this week? We would love it if you would!!! Categories: Cards | Tags: Card making, Cards, Christmas cards, cuttlebug, Merry Monday, rubber stamps, stamping, Stamping Up, stockings, Verve Stamps | Permalink. Love your pretty stocking with the holly leaves and berries. Great Christmas card. CUTE! LOVE all of the distressing and that sentiment with the holly die cut! I love the rusticness (or should I call it Shabby Chicness?) of this card, Nancy. Very nice card Nancy, I love the background texture and great papers. Love all the texture on your card and the fun stocking, Nancy. Thank you for Guest Designing with us this week at Merry Monday! Congrats on your GD spot this week! Love your stripey stocking with its holly die cut! Sweet card, Nancy! I love that textured background with the stocking and the holly leaves. Great distressing too! Love your card – the distressing looks fab! So glad to have you as a GD!! Great rustic Holiday card Nanc. Welcome as one of our Guest Designers this week, lovely to have you with us. I love all the distressing on this card, Nancy! And what a wonderful stocking! I’m so glad you could join the design team this week! Super cute, Nancy! Love all the fabulous texture! What a darling stocking…love all the distress, looks like a worn and well loved stocking that has been hung for years! Wonderful texture on the background too! Great card, Nancy! 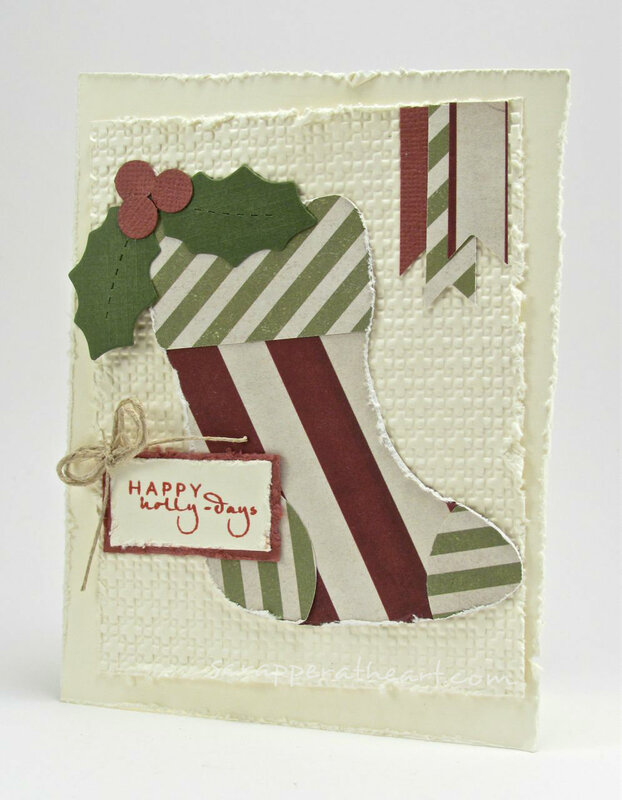 Congrats on being GD…Pretty card with a vintage look and your embossed background works perfectly with your stocking. Getting a pretty good head start on next year’s xmas cards I see. This is adorable. I love all the distressing on the card too. What a fun stocking you’ve created! I love the shabby look of your elements…but the sentiment is the BEST! Congrats on being one of our GDs this week! Love the pretty card you shared, Nancy! So happy you could come and join us this week! Love the Designer Papers you chose, pretty stocking. Love the soft distressed edges Nancy. A gorgeous card. So lovely to have you along as guest designer this week.